Over the past several months, the Trump-Pence administration, as well as Congress, have attacked women’s health and rights numerous times. Greater access to affordable and effective contraception has been one of the hallmark achievements of the Affordable Care Act (ACA). But now, the current administration is threatening to limit these gains with the release of sweeping regulations that would allow any employer, insurance plan, school, or individual to use the guise of religious or moral objection to deny access to no-cost contraception. By requiring coverage for contraceptives with no out-of-pocket costs, the ACA increased women’s access to a wide range of contraceptives. The National Women’s Law Center estimates that, as of September 2017, 62.4 million women now have insurance that covers contraception without having to pay out of pocket. One study estimates that women saved $1.4 billion in out-of-pocket costs in 2013 alone resulting from the ACA’s contraceptive mandate. On average, each woman saves $255 every year. The ACA mandates that private health plans require coverage for 18 methods of contraception used by women, including female sterilization, along with related counseling and services. It also requires this coverage to be provided with no patient out-of-pocket costs. As of spring 2014, two-thirds of women using oral contraceptives and nearly 75 percent of women using the vaginal ring did not pay out-of-pocket for these methods. Additionally, another survey found that 87 percent of women do not have out-of-pocket costs for intrauterine devices (IUDs). As of 2014, oral contraceptives accounted for 3.6 percent of out-of-pocket spending on health care for women with private insurance. Before the ACA’s contraception mandate, oral contraceptives accounted for nearly 21 percent of out-of-pocket spending. This decrease in the spending for oral contraceptives accounts for 63 percent of the drop in the average out-of-pocket spending on all prescription drugs. Nearly all women have used contraceptives at some point in their lives, and 62 percent of women are currently using at least one method. In a survey conducted by the Guttmacher Institute, 56 percent of women reported that access to birth control allowed them to support themselves financially, and 63 percent said that it allowed them to take better care of themselves and their families. 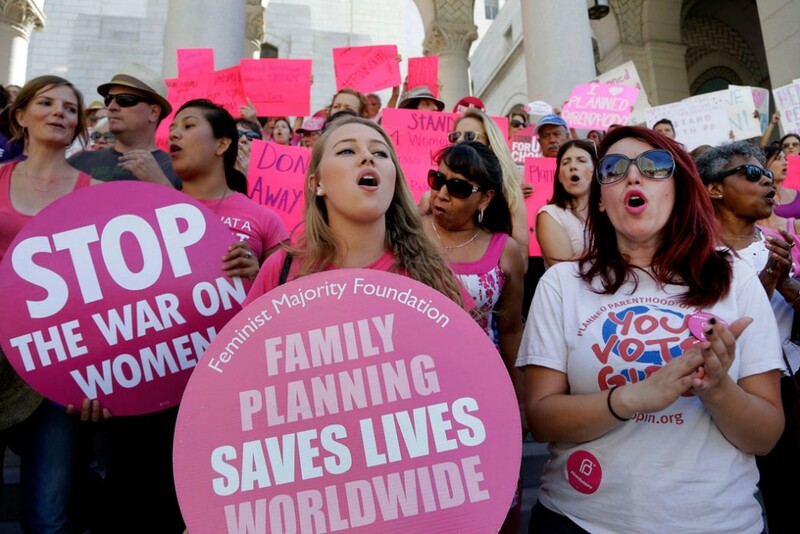 According to a recent poll, nearly 75 percent of voters believe that access to affordable birth control affects a family’s financial situation and is a vital component of equality for women. Before the ACA, unless a state had a contraception coverage mandate, individual insurers and employers could choose whether or not to cover contraception. Therefore, contraceptives made up an estimated 30 percent to 44 percent all out-of-pocket health care spending for women. Low-income women and women of color can face additional barriers to contraception access due to historical and systemic biases; lack of access to health care facilities; and economic hardship. Both Hispanic and black women are less likely to use effective methods of contraception, such as hormonal methods and IUDs, compared with white women. The rate of unintended pregnancies for Latinas is 58 percent, and the rate for black women is 79 percent. The rate for white women is 33 percent. The long history of health disparities among communities of color, including disparities in reproductive health care, calls for increased access to contraception and contraceptive counseling. Women experiencing economic hardship are less likely to take contraception or continue usage due to out-of-pocket costs. 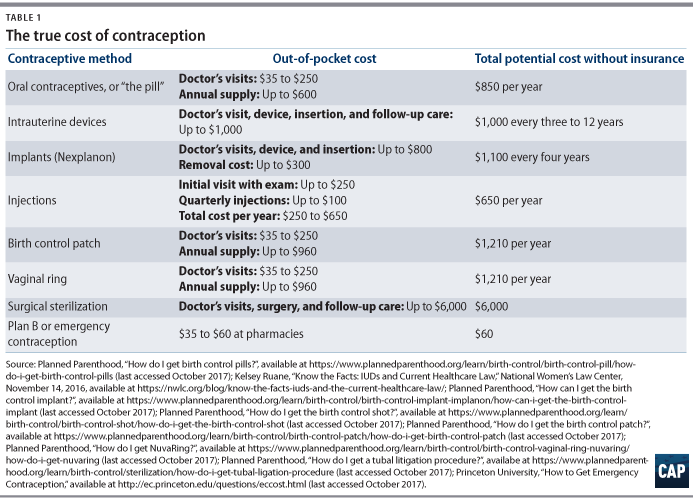 So how much does birth control cost exactly? This chart lays it all out. Jamila Taylor is a Senior Fellow at the Center for American Progress. Nikita Mhatre is an intern at the Center.